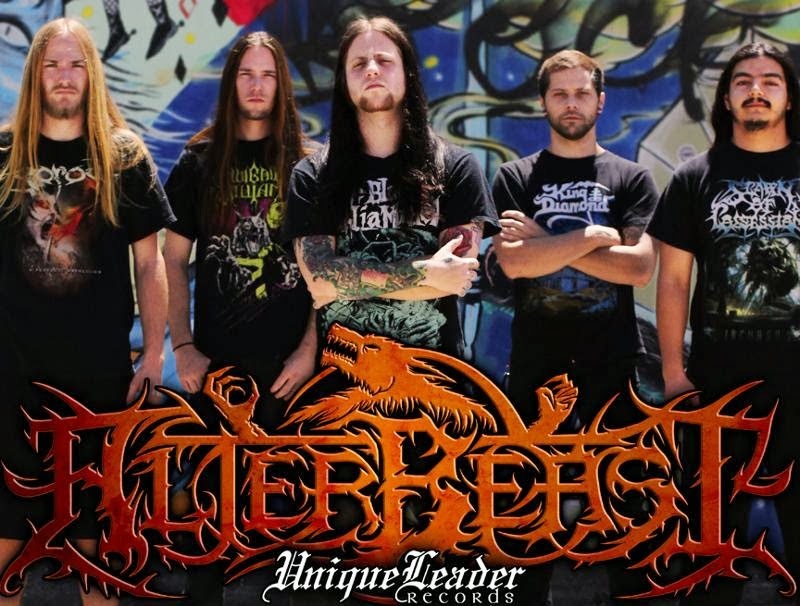 The crypt-keepers at the Deciblog are delighted to spew forth "Vile Remnants" from Sacramento progressive death metalists, ALTERBEAST. The latest spleen-rupturer comes courtesy of the band's Immortal full-length, set for imminent detonation just one month from today. Methodically assembled in several locals throughout 2013, with guitars and bass recorded at Augmented Audio in Los Angeles by former The Black Dahlia Murder bassist Ryan "Bart" Williams, vocals arranged at Mayhemeness Studios in Sacramento by Bob Swanson (Rings Of Saturn) and drums tracked at Castle Ultimate Studios with Zack Ohren (Light This City, All Shall Perish, First Blood, Cattle Decapitation, Warbringer et al), who also mixed and mastered the offering, Immortal is a dynamic, instrumentally pummeling and plainly scathing manifestation of auditory brutality. Said Sea Of Tranquility in an early investigation of the record, "Fans of Necrophagist, Morbid Angel, Death, Spawn Of Possession, Decrepit Birth, Beneath The Massacre, Deeds Of Flesh, and The Black Dahlia Murder will certainly love all the zig-zagging, herky-jerky riffs and blazing solos flying about.... These guys just crush on tracks like 'Vile Remnants' and 'Ancient's Retribution,' with [Gabe] Seeber's manic drum blasting keeping up every step of the way..."
Get mind-fucked with "Vile Remnants," currently wreaking havoc at Decibel,HERE. Additionally, you can still sample the sonic severity of "Mutilated Marvel" streaming at Gear Gods at THIS LOCATION as well as opening track "Flesh Bound Text" HERE. Formed in 2011 under the working title Gary Busey Amber Alert (GBAA), ALTERBEAST combines the teachings of The Black Dahlia Murder, Necrophagist and Spawn Of Possession with the classic death metal mastery of band's like Dissection and Morbid Angel into an irately cathartic sound expulsion. Immortal will wage war on the living on March 18, 2014 via Unique Leader. Preorder packages are available HERE.